Rail is an industry, which has stood the test of time, Mother Nature and two World Wars. Huge sacrifices and great acts of heroism were performed by rail workers in the Second World War effort including their vital part to ensuring the success of the Dunkirk evacuation where 327 special trains moved tens of thousands of soldiers from Channel ports. In 1994 it was the vision of the rail industry that delivered the Channel Tunnel connecting the UK to mainland Europe. Rail has achieved the longest sustained growth in history. Today’s network delivers 1.6 billion passenger journeys a year. Our passenger growth in the UK is greater than all other European countries, including France, Germany and the Netherlands. 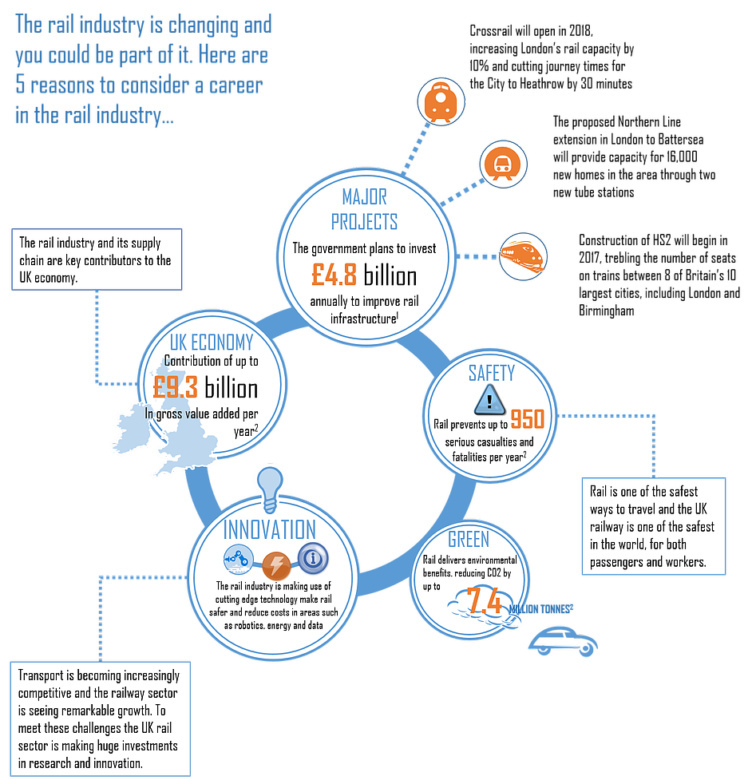 Rail provides more than 200,000 UK jobs, with around 40 % of those in the supply chain and that number continuously rises. The rail industry is vital to the country’s economic growth. Figures suggest that demand will continue to rise, with 14% more passengers and 19% more freight forecast by 2019. Come and see what we are about and take up a career in rail.